Can You Take Fish Oil With Blood Thinners? Christine Garvin is a certified nutrition educator and holds a Master of Arts in holistic health education. She is co-editor of Brave New Traveler and founder/editor of Living Holistically... with a sense of humor. When she is not out traveling the world, she is busy writing, doing yoga and performing hip-hop and bhangra. Fish oil has many health benefits, including positively impacting brain function, nerves and anti-inflammatory responses, according to Shari Lieberman, PhD, in her book, "The Real Vitamin and Mineral Book." However, some of the effects of fish oil on the body may interfere with prescription and non-prescription medications, including those classified as blood thinners. Therefore, it's important to work closely with your doctor to determine whether or not taking fish oil supplements is right for you. Blood thinners, which are sometimes called anticoagulants or antiplatelet agents, refer to prescription or over-the-counter drugs that actively thin the blood to help in preventing heart attacks or stroke. In his book, "Thriving With Heart Disease," Wayne M. Sotile, PhD, writes that blood thinners either prevent platelets from forming a clot, or they interfere with blood's normal coagulation. Most often, blood thinners are taken by those whose heart valves have been replaced with mechanical ones, those who have had coronary artery stents put in, or individuals who have had recent clots in coronary arteries. Fish oil does thin the blood in similar ways to blood thinners, notes leading health and medical writer Jack Challem in his book, "The Inflammation Syndrome." This effect happens through the prevention of the platelets found in blood from sticking together and forming clots. Challem adds that the blood-thinning effects may be magnified if you are taking natural blood-thinners, such as vitamin E or gingko. Therefore, it's important to tell your doctor if you are taking fish oil. Due to its blood-thinning effects, many doctors, such as Stephen R. Devries, MD, in his book, "What Your Doctor May Not Tell You About: Cholesterol," recommend that you do not take fish oil when you are on blood thinners, such as Coumadin. Beware that foods high in vitamin K, such as leafy green vegetables, also thin the blood naturally -- and can cause complications if you're taking a prescription blood thinner. Challem, on the other hand, recommends having your physician monitor you if you would like to take fish oil while on a prescription blood thinner. So check with your personal physician. Always let your doctor know if you are taking fish oil, especially when suffering from heart disease or before surgery. Do not take fish oil if you are on a blood thinner without your doctor's approval. 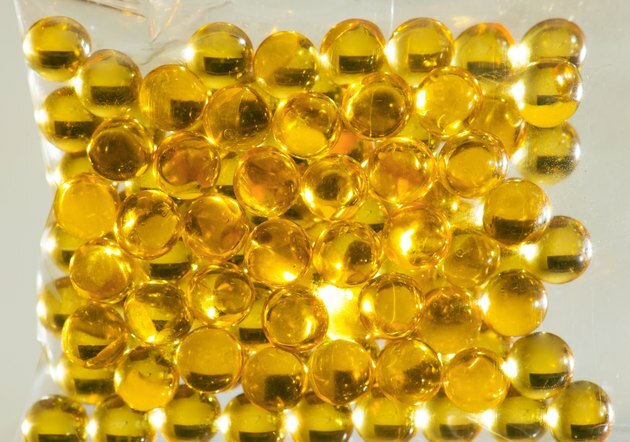 In some cases, it may be possible to take fish oil instead of a prescription blood thinner; however, this decision is up to the discretion of your doctor. Be aware that many foods can thin the blood, and it is important to closely monitor symptoms when heart disease in an issue. Does Fish Oil Thin Blood & Get Dangerous With Aspirin? Why Use Vitamin K Before Surgery? Can Fish Oil Cause an Irregular Heartbeat? Do Vitamin D Supplements Cause the Blood to Be Thin?